293/Control cells were generated by stably transfecting HEK293 cells with a pUNO control plasmid expressing either the lacZ reporter gene or a multiple cloning site. 293/LacZ cells express the lacZ reporter gene and can be used as a control cell line for 293/TLR and 293/NOD cells. 293/null cells contain a multiple cloning site and can be used as a control cell line for 293/TLR and 293/NOD cells. 293XL/null cells express the human antiapoptotic Bcl-XL gene and contain a multiple cloning site. They can be used as a control cell line for 293XL/TLR cells. 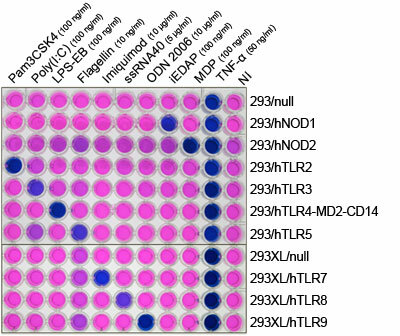 293/TLR, NOD and control clones were transfected transiently with pNiFty-SEAP and stimulated with TLR and NOD ligands. After 16 hour stimulation, NF-κB-induced SEAP activity was assessed using QUANTI-Blue™, a SEAP detection medium. Cyanobacterial antimetabolite 7-deoxy-sedoheptulose blocks the shikimate pathway to inhibit the growth of prototrophic organisms.